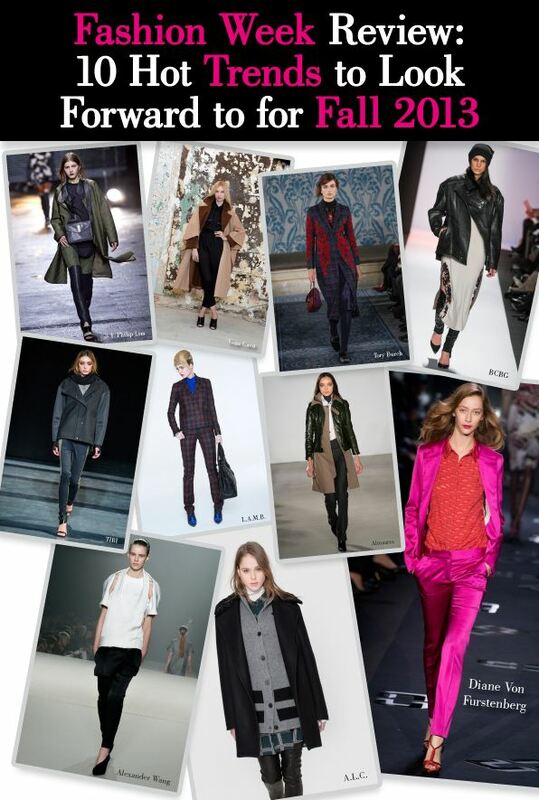 NYFW has come and gone in a flash, but it has left us with some serious lusting over Fall’s hottest trends. There were plenty of new looks on the runway this season that make me want to fast forward to September/October (well, ok maybe that’s a loaded statement – really I just mean for the fashion, not the weather). There were also a lot of recycled trends, but they all had their very own new twist on them making them fresh and even more desirable. 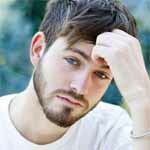 There were a lot of great trends out there, but here are 10 that really stood out and you can look forward to rocking this fall. I love me a great coat, but then you add some serious embellishment and this great coat is on a whole new level. I loved the spruced up look for fall and love that this is a look that anyone can pull off because this look comes in a variety of shapes and styles. The key here is to pick something you know already looks great on you, then worry about the embellishments. Or, if you’re daring and want to try something new or the adornments are more important to you than the style, then choose your look that way. 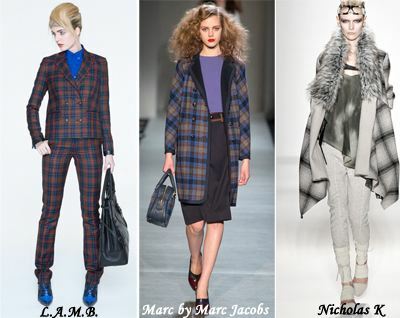 Plaid always gives me a little grunge rock, 90s kind of vibe but that’s not the case anymore. Plaid has received a super fab makeover and now I want to load my closet with this print! It was everywhere from suits to separates to outwear and it was looking as chic as ever. If you’re bold and daring, try a head to toe look or if you’re not as plaid-loving then try incorporating a few pieces you can rotate into your current looks. 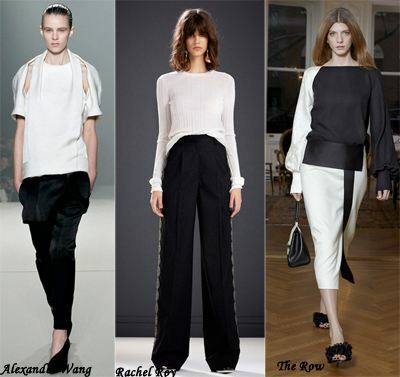 Nothing is chicer or sleeker than a black and white look. It’s classic, it’s clean, and it’s super easy to pull off. Plus, with the gorgeous detailed separates and dresses of the season it’s kind of impossible not to look amazing. To amp up the look, choose rich and luxurious fabrics to mix, find something with interesting color blocking, and keep the accessories very minimal. 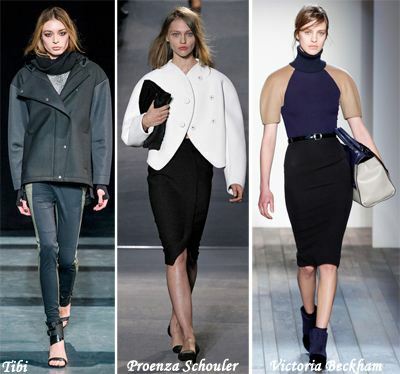 Color blocking isn’t going anywhere if the Fall 2013 runways have anything to say about it, and they said a lot. 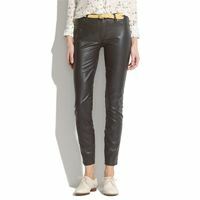 There was a lot of this trend going around and it was more amped up than the spring looks we’ve seen in the past. More colors were added to the block mix, unusual colors were paired together – this looks has kind of just taken on a life of it’s own. What I really loved is that a lot of the looks had some interesting geometrical designs, creating even more eye catching detail. 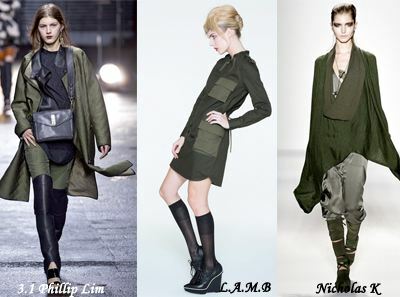 I’ve always been a huge fan of the army green look. 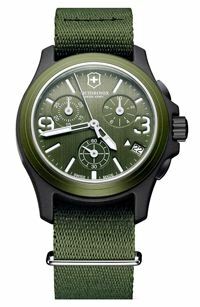 It looks tough and edgy while still looking sophisticated and is just an all around great color. 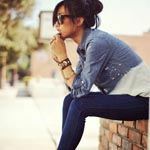 It’s an easy one to mix into your wardrobe whether it be separates, accessories, or outerwear and can be paired in a variety of ways. I love the rich textures and styles of Fall’s looks and can’t wait to rock this particular trend later this year. So this look may not be for everyone, but it surely was EVERYWHERE on the runways. 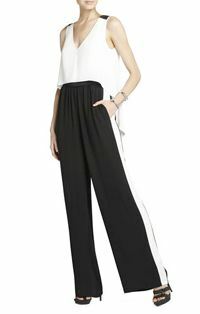 Yes, I’ll agree that it can look a little clownish, but I quite like it and will definitely be rising to the occasion and trying the big, rounded shoulder look this fall. If you’re not sure about this one, I would suggest trying out some outerwear pieces because the look doesn’t come off as so severe. I say at least give this one a “try-on” before you pass on it – you may grow to love it! 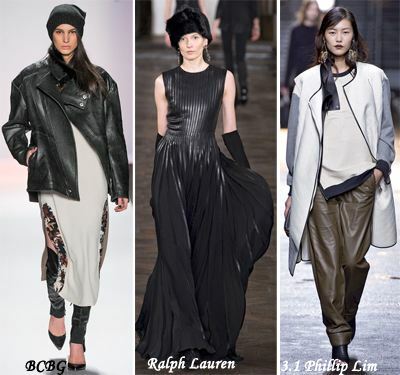 Leather always seems to make an appearance regardless of the year and season, but it just exploded all over the runways for Fall and in some interesting styles and designs. 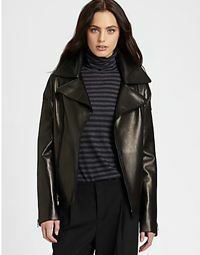 It was shown in just about every major trend so your choices will definitely not be limited when it comes time to throw on your leather best later this year. 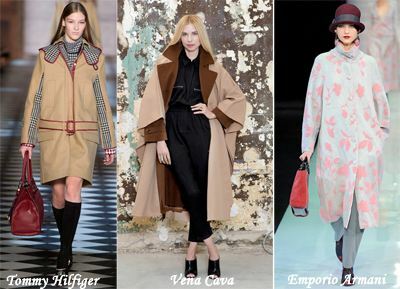 Another trend that may not be everyone’s cup of tea, but the oversized coat was another look that just kept coming down the runways. If done the right way, this look can be both edgy and sleek and is just really amazing. 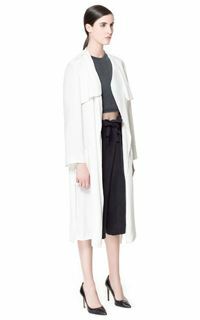 Fit is of the utmost importance here but once you find the right cut and style you’re well on your way to owning that comfy oversized coat trend. Quick tip: don’t want to invest in an oversized piece just yet? 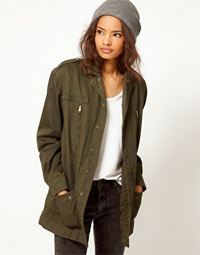 Borrow a jacket from your brother or boyfriend or hit up a vintage or thrift shop and buy a jacket in a size or two larger than normal or scour the men’s section. You can always tailor any vintage/thrift finds to fit better. 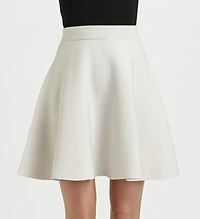 It’s fun to see short skirts for Fall/Winter. 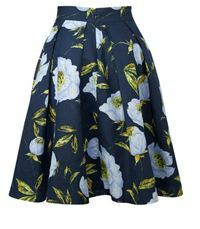 Just because it’s cold out doesn’t mean you can’t show off your gorgeous gams and the season’s flared skirts lets you do just that. The look is fun and flirty and can be dressed up and dressed down in so many different ways. Tons of styles, lots of prints, different cuts – you won’t be bored with your options this season. 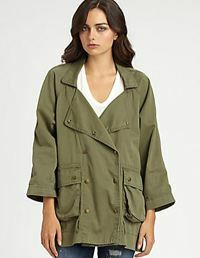 We layer our cardigans, sweaters, tees – hell, I’ve even layered my skirts – so it seems fitting that layering outerwear would be the next big thing and it is. The Fall runways were stomped on my models in so many different variations of this trend that it’s completely embedded in my head and I can’t get enough (I’ve been doing this look religiously since NYFW started – see, told you). It’s easy to pull off and it keeps you extra warm on those extra cold winter days. Play with combining texture and proportion for a really interesting, statement making look. 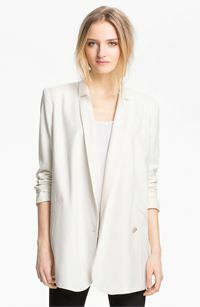 Zara Long Flemming Trench Coat, $129. 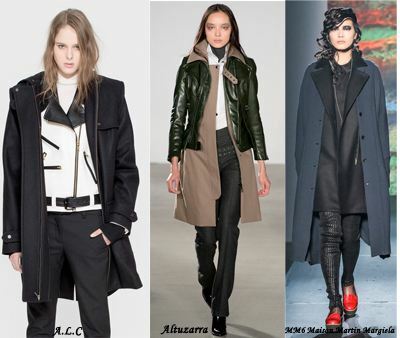 Try layering over or under a leather or denim jacket or even try pairing under another more structured trench. The light fabric makes it easy to work with. 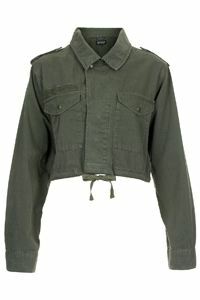 TopShop Cropped Army Jacket, $60 (on sale). 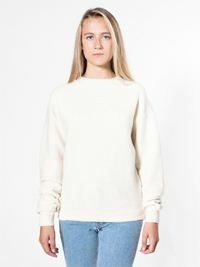 A great piece to layer under your jackets, or even over. Try pairing under a structured, more classic coat for a total contrast in style and fabric, or layer under something bright or printed for a hard contrast against a feminine look. 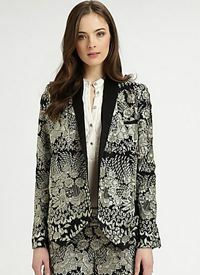 Anthropologie Floral Batik Drapery Jacket, $298. Layer this under or over anything for an instant pop of color and pattern that can’t be missed. Try mixing with other colors to create some interesting color blocking or layer under textured neutrals for some pretty contrast. 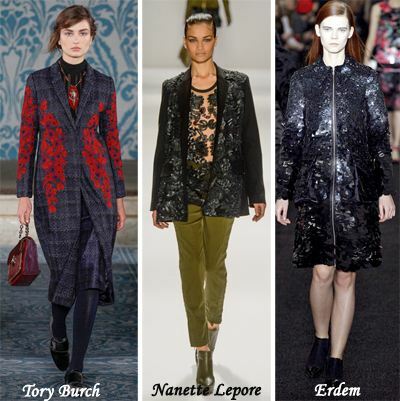 There you have it – 10 incredibly fabulous trends that are just waiting to be worn for fall! 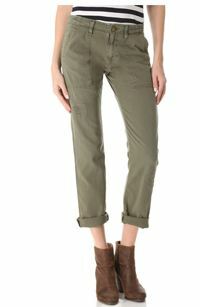 And if you can’t wait that long, there are plenty of spring pieces out there to get you jump started. What trends are you loving and ready to try? Which aren’t you so into? Share your comments below!